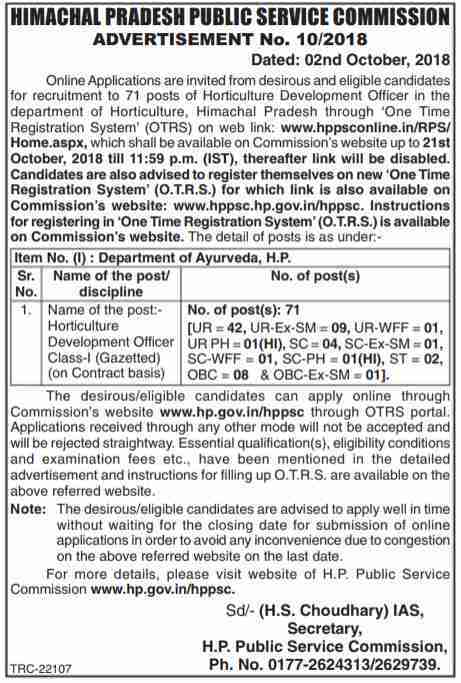 HPPSC Recruitment department is inviting Government job applications from eager and suitable applicants for the employment of Horticulture Development Officer in the department of Horticulture, Himachal Pradesh. 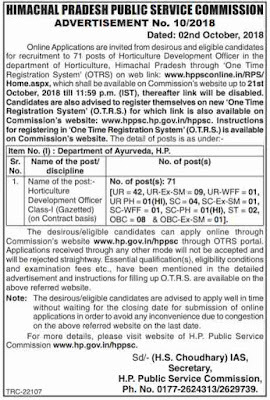 There are total 71 vacant positions for the same job profile which are going to be filling up through this HPPSC Recruitment procedure 2018. Applicants have to apply online through the ‘One Time Registration System’ (OTRS) on to the following web link: www.hp.gov.in/hppsc. More information related to these Government jobs in HP is given below in this article. Read it carefully before applying online through the department website. Categories-Wise Vacancies Detail: [UR = 42, UR-Ex-SM = 09, UR-WFF = 01, UR PH = 01(HI), SC = 04, SC-Ex-SM = 01, SC-WFF = 01, SC-PH = 01(HI), ST = 02, OBC = 08 & OBC-Ex-SM = 01]. Education: Official Notification is not out yet by the department on their official website. We share this information on the basis of the Newspaper Notice. This Notice you can also read in the newspaper (The Tribune). When Notification is out we will share the educational age criteria as well. The wanting/qualified contenders can apply online through the Commission’s website whose link is as follow: “www.hp.gov.in/hppsc” through OTRS portal. Applications received through any other mode will not be accepted and will be rejected straightway. 21 Oct. 2018 is the Last Date to apply.